Sophomore defenseman Meirs Moore came up with the game-tying goal in the Section 7AA final with just 1:30 remaining (Photo by Tim Kolehmainen). Meirs Moore looks innocent enough. 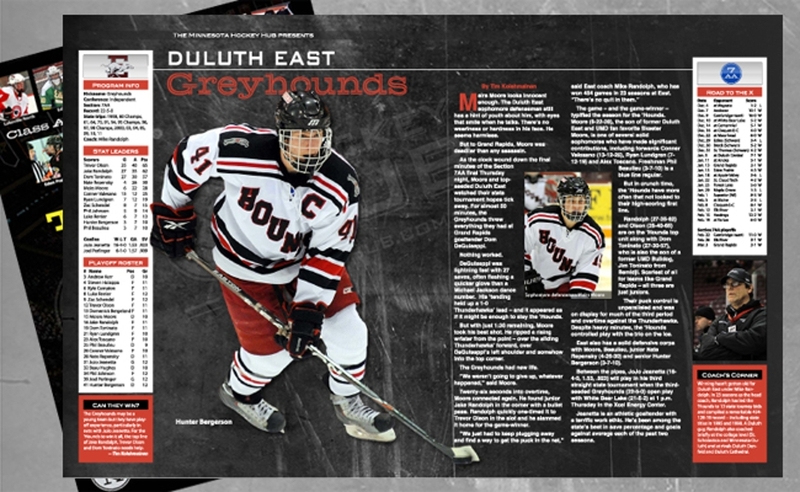 The Duluth East sophomore defenseman still has a hint of youth about him, with eyes that smile when he talks. There's no weariness or hardness in his face. He seems harmless. But to Grand Rapids, Moore was deadlier than any assassin. 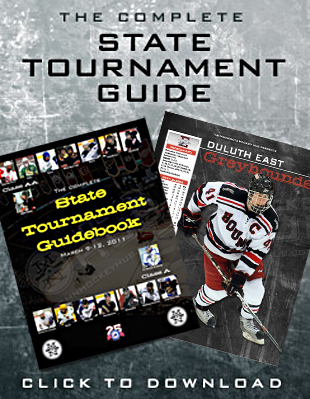 As the clock wound down the final minutes of the Section 7AA final Thursday night, Moore and top-seeded Duluth East watched their state tournament hopes tick away. For almost 50 minutes, the Greyhounds threw everything they had at Grand Rapids goaltender Dom DeGuiseppi. DeGuiseppi was lightning fast with 27 saves, often flashing a quicker glove than a Michael Jackson dance number. His 'tending held up a 1-0 Thunderhawks' lead -- and it appeared as if it might be enough to slay the 'Hounds. But with just 1:30 remaining, Moore took his best shot. He ripped a rising wrister from the point – over the sliding Thunderhawks' forward, over DeGuiseppi's left shoulder and somehow into the top corner. The Greyhounds had new life. “We weren't going to give up, whatever happened,” said Moore. Twenty-six seconds into overtime, Moore connected again. He found junior Jake Randolph in the corner with a bullet pass. Randolph quickly one-timed it to Trevor Olson in the slot and he slammed it home for the game-winner. “We just had to keep plugging away and find a way to get the puck in the net,” said East coach Mike Randolph, who has won 454 games in 23 seasons at East. The game -– and the game-winner -- typified the season for the 'Hounds. Moore (6-22-28), the son of former Duluth East and UMD fan favorite Skeeter Moore, is one of several solid sophomores who have made significant contributions, including forwards Conner Valesano (13-12-25), Ryan Lundgren (7-12-19) and Alex Toscano. Freshman Phil Beaulieu (3-7-10) is a blue line regular. But in crunch time, the 'Hounds have more often that not looked to their high-scoring first line. 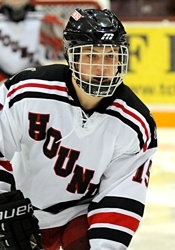 Randolph (27-35-62) and Olson (25-40-65) are on the ?Hounds top unit along with Dom Toninato (27-30-57), who is also the son of a former UMD Bulldog, Jim Toninato from Bemidji. Scariest of all for teams like Grand Rapids – all three are just juniors. Their puck control is unparalleled and was on display for much of the third period and overtime against the Thunderhawks. Despite heavy minutes, the 'Hounds controlled play with the trio on the ice. East also has a solid defensive corps with Moore, Beaulieu, junior Nate Repensky (4-26-30) and senior Hunter Bergerson (3-7-10). Between the pipes, JoJo Jeanetta (16-4-0, 1.53, .923) will play in his third straight state tournament when the third-seeded Greyhounds (22-5-0) open play with White Bear Lake (21-5-2) at 1 p.m. Thursday in the Xcel Energy Center. Jeanetta is an athletic goaltender with a terrific work ethic. He?s been among the state's best in save percentage and goals against average each of the past two seasons. The Greyhounds may be a young team but they have playoff experience, particularly in nets with JoJo Jeanetta. For the ‘Hounds to win it all, the top line of Jake Randolph, Trevor Olson and Dom Toninato needs help. Winning hasn’t gotten old for Duluth East under Mike Randolph. In 23 seasons as the head coach, Randolph has led the ‘Hounds to 13 state tourney bids and compiled a remarkable 454-128-19 record -- including state titles in 1995 and 1998. A Duluth guy, Randolph also coached briefly at the college level (St. Scholastica and Minnesota-Duluth) and at rivals Duluth Denfeld and Duluth Cathedral.